All transactions are safe and secure with a reliable history in online purchasing behind each of our associates. 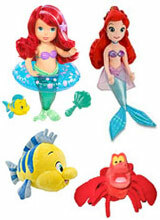 Buy the Little Mermaid Bath Toys, Dolls, Sebastian and Flounder Plush to own Little Mermaid clothing and merchandise. Bring home the under the sea world from the Disney movie, including Ariel toy figures and dolls, Little Mermaid bath toys, and Flounder and Sebastian plush stuffed animals. Your child will have hours of fun reliving the storyline via these adorable characters. Whether in the bathtub, the living room or snuggled up to go to sleep, your little one is bound to have a favorite, if not all of them. In addition to the Little Mermaid Bath Toys, Dolls, Sebastian and Flounder Plush above, browse the Little Mermaid Clothing Gallery for more apparel like men's and women's clothes, kids shirts or hoodies.